← What next for The Wine Society? 2) Most people think that all wine is pretty natural, so what’s the big deal? 4) Some of it tastes pretty wild and funky, looks pretty weird and seems a bit unstable. If people want something that seems wild, funky, weird-looking and a bit unstable, they’ll go to see Bootsy Collins. Of those, the first is the key issue. It is very hard to take seriously such an apparently disorganised organisation, but the truth is there is no organisation, just a hotch-potch assemblage of vaguely like-minded winefolks. Things might start to look up once this is resolved, firstly because it seems bizarre that grapes can be certified organic but that no system exists for noting the wineries whose approach continues along similarly chemical-free lines once they are plucked from their vines, and secondly because they’ll have a logo to stick on bottles. And everybody loves a logo, especially when it’s on a sticker. First there’s some arguments to be had about precisely how hardline a winemaker has to be to qualify. Can they use sulphur dioxide, a common stabiliser throughout the winemaking process and especially at bottling, and if so how much? Can they start the fermentation process with a commercial yeast? Can they add acid, or sugar, or use oak chips? As for the wines, they’re impossible to generalise. I’ve heard some people say that they “don’t like natural wine”, a concept as bizarre as saying they “don’t like socks”, because some of them are dirty. But I’m no less bemused by those who say that they don’t drink anything else, and those people do exist, because there are plenty of intense, provocative, interesting wines made outside the natural wine umbrella. The truth is that there are some brilliant natural wine, some dodgy natural wine, and some downright baffling natural wine, but the very best are really inspiringly delicious. So, a few tips: I’ve been impressed in the past by the cheaper wines made by Cos in Sicily (Frappato and Cerasuolo), delicious and bright and in no way scary (but don’t think that I’ve been unimpressed by the more expensive ones – I just haven’t tried them), the very good value wines of Domaine Fondreche in the Rhone, and the outstanding but pretty expensive Brunello from Paradiso di Manfredi. At a recent tasting of natural wines held to drum up support for this weekend’s event I really liked a 100% carignan from the Languedoc called Terre Inconnue Leonie, an almost entirely useless tip because it’s made in tiny quantities and you can’t buy it, and a soft, full, lovely and not at all scary Marsanne/Rousanne blend calles Les Muriers, from Mas Bruguieres. But there are also the wines that are a bit out there, guilty perhaps of having an excess of personality. They’re fun to try, but probably a bit miserable to be stuck with for a whole evening. 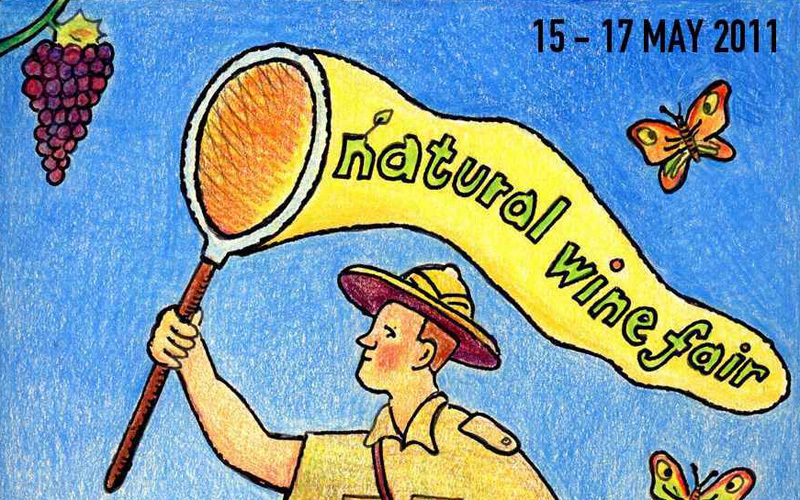 If anything the pot-luck nature of “natural” wines means it can only be a good thing to be somewhere with little bits of lots of them and no chance at all of getting stuck with one you don’t like. In other words, go to the fair this Sunday and see what all the fuss is about.